Westfriesland and the Westfriese Omringrijk (“Westfrisian Encircling Dike”) are inextricably linked. The 126 km long dike marks the border between Westfriesland and the surrounding regions of North Holland. The Westfrisian Omringdijk is one of the oldest dikes of the Netherlands and the only one in the world that has been recognized in its entirety as a national monument. Westfriesland is an ideal region to enjoy for cyclists and walkers alike. While doing so, you will often pass or follow a part of the Omringdijk. Many see it as a challenge to follow the entire dike by bike or on foot. Its many waterways also make it an excellent experience to explore the region by boat, especially using special electric ‘whisper boats’ that soundlessly glide through the fields and nature reserves. Those who prefer the car or other means of transportation will also enjoy the Westfrisian landscape and the Omringdijk. The region is known for its typical linear villages, many authentic farmhouses, windmills and sweeping views, but also its cities are certainly worth a visit. 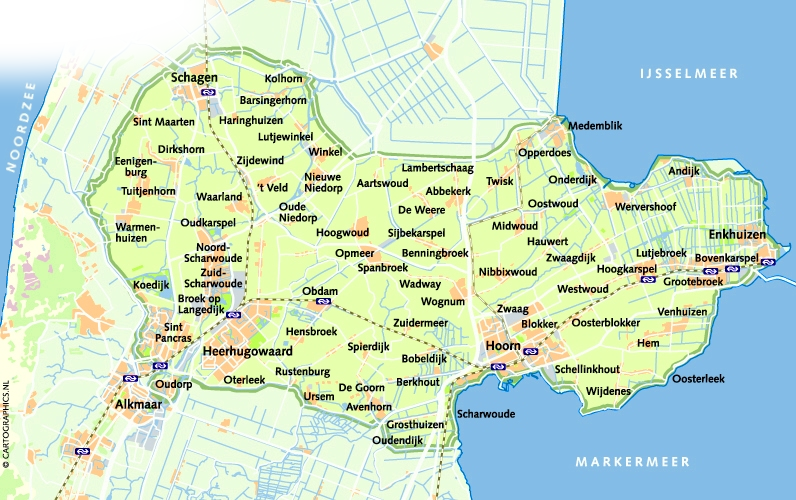 The cities of Alkmaar and Schagen, located in the west of Westfriesland within 10 km distance of the North Sea beach) as well as the towns of Medemblik, Enkhuizen and Hoorn in the east next to the Ijsselmeer and the Markermeer are beckoning tourists to pay a visit to their pretty and lively town centres. Experience Westfriesland and the Westfriese Omringdijk and, as the Westfrisians themselves say, “Je koike d’r je ouge uit”… you won’t believe your eyes! Click on the place name for more information.